Our Confetti Guns use both 40cm & 80cm Confetti or streamer powershot cannons to fire 1 or 3 shots at once. These are perfect for Concerts or for DJ's to interact with a crowd. Easily reloaded for multiple hits throughout an event. The gun is fully remote pre-charged with a battery meter on the gun itself. It also comes equipped with a support strap & laser guide to see where you are aiming. 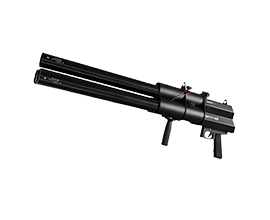 Great for clubs, tours or festivals these fantastic guns are a great addition taking your confetti shot to the next level. Consumption & output - Electric Confetti Cannons 40cm: 5m - Electric Confetti Cannons 80cm: 12m - Electric Streamer Cannons 40cm: 10m - Electric Streamer Cannons 80cm: 20m!